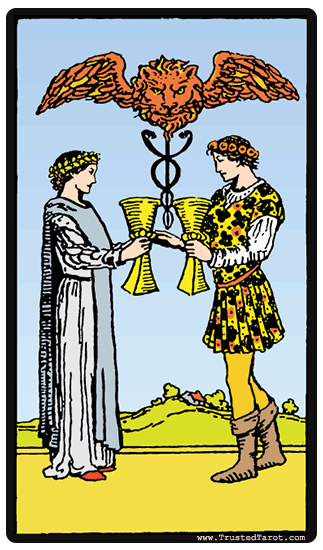 To see the Two of Cups is an indication of a partnership that is built on the union of forces, a strong connection and a balanced and equal partnership. The exchange of cups suggest that each party's emotions are intertwined with the other's, and each participant's feelings have profound affects on the other. A strong pair is indicated here, the joy of two becoming one. A strong pair is indicated here, the joy of two becoming one. When it comes to work, you may notice that the people around you will start to appreciate you more. There is a mutual respect here, meaning you will also be more comfortable in your workplace. If you are looking for new job opportunities, this card may be a good sign. In terms of love, the card represents commitment, a balanced relationship, and love. But this does not simply mean that you will no longer need to nurture your love to make it last. The card only signifies that true love and affection is present. In your finances, the Two of Cups is associated with fairness and balance. This means that you are currently financially capable and you have the right amount of money to deal with your obligations. In relation with your health, people who are currently facing some health issues need to look for a practitioner that they will be comfortable working with and whom they can trust. In spirituality, it is a call for you to be more endearing and loving towards the others. You are receiving positive energy from the universe, and you need to share that energy. When reversed, the Two of Cups can mean that the balance that was once there is broken. This balance was an integral part of keeping the individuals together, but to break it is to create disconnection and discord. The negative energy of two forces is present, and instead of them joining or attracting, they seem to repel each other. You may be finding that certain small details that were not problems before are coming into play, signaling that one party may have resentments. A line of communication that allowed you and the other party to openly talk about disagreements has been cut off, only worsening the cycle of resentment and imbalance. Be the first to open up, and you may find the problem much easier to repair than you thought it would be.